Are all TLRs made in Japan or Germany or China or Rassia or other european countries? Here goes Graflex 22, which is made in the USA. The Graflex 22 was a continuation of the Ohio-made Ciro-Flex series. 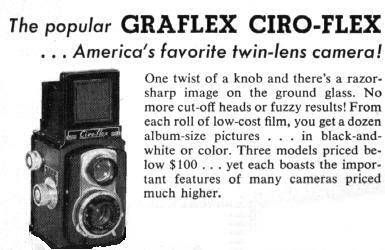 Graflex bought the tooling and parts from Ciro, and continued making the cameras. The Graflex 22 is a knob-wind twin-lens TLR, using 120 film. A red window in the rear shows the film position; some models have a metal cover. The lenses are Tessar-type and made by Wollensak. There were three or more models made with 83mm and 85mm f/3.5 taking lenses, the top-of-the-line model having a M-X-V fully synchronized shutter with a 1/400 sec top speed. It is not an interchangeable lens camera.